I had a settlement get cancelled and the contract voided over this. Without electric, the basement sump pump could not kick on in a flood situation to pump out the incoming water. A hundred dollar savings became thousands in clean up costs for the Seller. It is expensive being cheap. Please leave utilities on for new owners...who are veterans! This morning I received an "urgent" E-mail from one of my Sellers. Apparently now that we are under contract with an October 3rd closing date, this person thinks it's perfectly acceptable to just turn all utilities off including water. At first I really didn't know how to respond. I mean, we're almost there. You really want to do something like that when closing is within our reach? 1) if you turn the water off and all of your wonderful landscaping dies you are breaking your contract to keep the home in the same condition it was when the contract was written. DUH! 2) we still have to make it through appraisal and since this particular loan is going VA they very well may need to access these utility services for the report. DUH! 3) it's just rude. After all the time we both spent marketing your home and finding the right buyer you want to turn around and make them pay exorbitant re-connection fees?! Hello! These people serve our country...have a little respect! DUH!!! Be kind to people. It's likely going to come back to you some day. Be rude and nasty to people. The same rule applies. 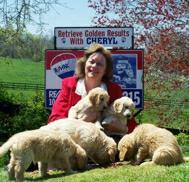 You'll "Retrieve Golden Results" with Cheryl Ritchie, RE/MAX Leading Edge, for all your Southern Maryland and Anne Arundel County Real Estate Services. EMailGoldenGirl@GoldenResults.com for the Golden Results YOU Deserve. It's A Car, It's A Plane, It's A Flying Car!! Smart sellers pricing it right. Forget the Boat Slip, You Just Need a Single Car Garage for This Ride! Does your current insurance policy cover your dog? Are "Pocket Listings" Bad for Sellers?